Emails that convert is a series of short posts that is focused on giving small actionable advice on managing your email campaigns. All our tips can be implemented in less than 5 minutes. One of the main issue for all email campaigns is the deliverability rate. We’ve already covered that in our previous posts. It’s a complex issue that depends on too many factors – and we’ll keep covering the most important here. We’ve already discussed that awesome trick you are missing – the Alternative text field and its powers. There are some other details you need to think of before adding the image in your email – the size of the image file – both in pixels and bytes. What is the main issue with big images? Let’s separate the terms „big image size“ and big file size. One is related to the pixel size, the other – to the bytes. They both have to be considered when adding an image to an email, both for different reasons. Outlook and similar – When you’re uploading an image in an email, you are probably resizing it using the provided settings. The message looks good, the image size is correct and we can safely send the email. That would have been true in a perfect world without MS Outlook ?. If you don’t use it for your daily email, you might never know. An image in MS Outlook shows with its original size. Now imagine that email where you used a banner 2000px wide. Not a great picture, right? And it’s not just Outlook users that are experiencing this size reverting. We never know which service are our contacts using at the moment – so we need to consider that. The only safe way to go is to resize your pictures first, upload second and add alternative text third ? Resizing – When it comes to email size, everyone has a different opinion. Some prefer their emails without a wideness restriction, others choose 600px, or 350px. With Apple Mail, Gmail and Inbox now making your emails responsive automatically, I’d suggest you don’t restrict your emails design the old way. But that still means you need to choose a size for your images. I’d recommend a maximum of 550-600 px width, if there’s going to be just ONE image on the row. Calculate accordingly if you want to fit more than one image. Truncated emails – I’m sure you’ve received at least once an email that was so big, that Gmail didn’t want to show it to you in its fullness. It just decided not to load the whole chunk unless you really need it and you had to click at the bottom to have a new browser tab open. How many times did you scroll and click – I bet it’s closer to 0 than to 100% of the times. What caused it was an extensive use of code and images. An email has to be below ~102 bytes, in order for the email providers to load it at once. If you need to use a lot of images in your emails, you might be risking the cut. An image you’re uploading in an email should never be MBs of file size. That’s one thing that you need to remember. Compressing – The good news is that there is a simple and very efficient way of taking care of that. It’s called image compression and works both for .PNG and .JPEG files. Image compression keeps the size of the image, keeps the quality but by removing some of the pixels (or, I don’t know, using magic?) it makes the file size significantly smaller. 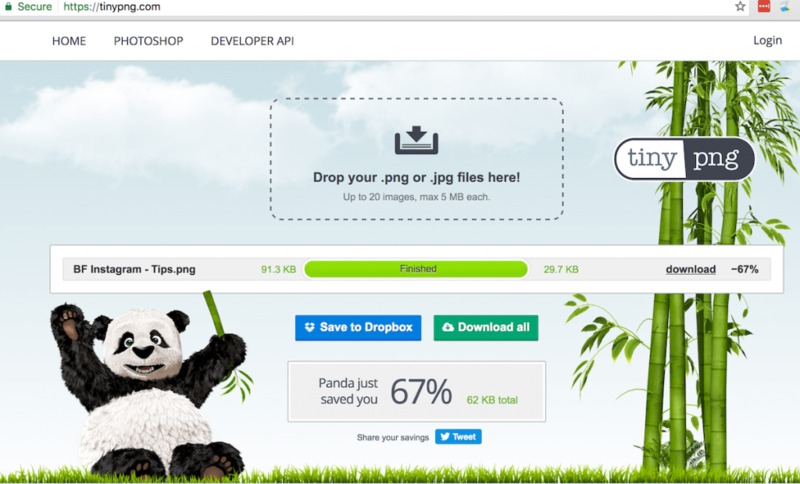 I use a browser based service called TinyPNG and it’s free and awesome. They also offer a WordPress plugin that can do the same for your website. You can also compress images with Photoshop or other similar programs – but that would require more steps and is not that comprehensive. I personally try to compress all images used for emails – it’s like bullet-proofing it for great user experience. Another issue I’d like to discuss while we’re still talking about images and sizing, is the image to text ratio in your emails. Images are so expressive that we prefer to use them whenever we see fit. That could cause another deliverability issue – the SPAM filters can’t see what’s on the image and will start thinking you’re hiding something from them. Even the alternative text on the images won’t help – you’ll start experiencing lower and lower deliverability rates. That is, if you don’t follow the golden ratio – 80% text, 20% images. SPAM triggers – as I said, the filters will start identifying your emails are not so safe. They need to be able to check for their usual triggers and you could be hiding them on the image itself. Once your email becomes mostly images and little text, that raises a big red flag. Think about that – you want your marketing emails to feel like personal friendly emails. You probably send your friends some funny images and GIFs – and nothing else. You’ve already established a connection with them – the system knows they trust you and you probably won’t send them phishing links or strange offers about medical products. When you’re sending a marketing email, the filter already knows it’s not that personal – the unsubscribe link at the bottom kind of spills the beans. Readability – That is something else you need to always think about. I call it User experience – how does the email looks and feels for the person receiving it. I often reply to marketing emails that have poor formatting or use a small font size – because I don’t enjoy reading them, but I want the content. When one of your contacts receives an email full of fancy colorful images – will they be able to identify the main focus? Will they be able to just scan through the content and find what interests them? We have so many visual distractions nowadays, that simply reading a text without one is an experience we get only from a book now. The less distractions – the better. It will also make you a better copywriter. One objection I often hear when I talk about the image to text ratio with my clients is that companies like Zalando (and similar – usually e-commerce fashion stores) send newsletters constructed out of images only. But you don’t have a dedicated IP address for mailing millions of customers and don’t manage your service by yourself. Small businesses have a limit on the resources they have available. Paying $5k+/month just to send all-images and no-text newsletters makes no sense to me. You need to adapt to the requirements – but if you find a way to break the rules that brings in more ROI – good for you! You’re probably thinking about implementing those simple steps in your email preparation process and wondering why is it so complicated. It’s not. It’s a bit time consuming, but the steps are easy to follow and take no time at all. With this tip I can’t promise you immediate increase of your engagement rates but I promise you’ll have better looking emails and happier to open them recipients. You will also see a change in your deliverability rate in time – if you fix your image to text ratio. I’m looking forward to learning more about your image strategy and if you liked this tip – don’t forget to leave us a comment below. I’m loving this series of posts. I was making this mistake too! super tips – thanks so much!! Pixel size is always a challenge for me, and I wasn’t aware of the Outlook’s display of images. So useful Diana, thanks for this! Great tips! I don’t think much about the images I add to my emails, now I’m going to be using these tips next time!